The year is finally coming to a close, which means I can pick my collards. I’ve been holding off for a while, hoping I’d have enough to make for New Year’s Day. I do! I did. 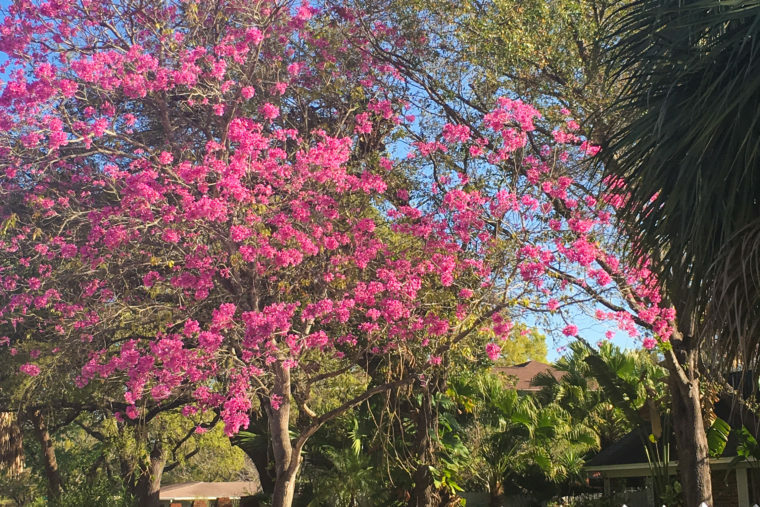 Just picked a bunch this morning. 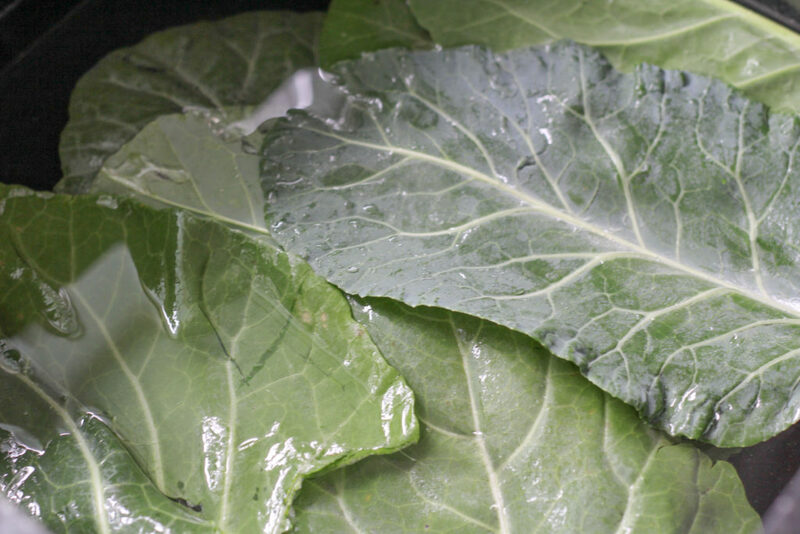 If you’ve been with me for a while, you may have seen a few collard recipes around here. They’re my favorite vegetable. 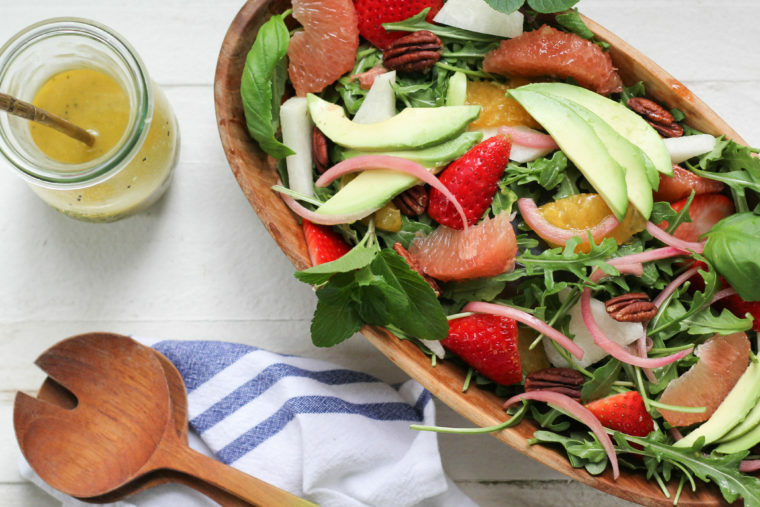 Most are pretty healthy, vegetarian, and sometimes even raw (gasp!). I know plenty of other collard devotees, and I may have even converted a few. But try as I might, I have some holdouts in my family. I won’t name names. It’s not that they’re opposed to eating collards, it’s just that they prefer them cooked a certain way, and by that I mean cooked to death. I see them swoon over them at our favorite barbecue restaurants. Just this once, I want to see them swoon over my collards like that. This year, I’m giving the people what they want! These are slow-cooked, BBQ joint-style greens that are simmered with meat for hours until they’re soft and swamp-colored. Not that there’s anything wrong with that. First, pick your poison: bacon, smoked ham hocks, smoked turkey wings… or all three. I won’t judge. 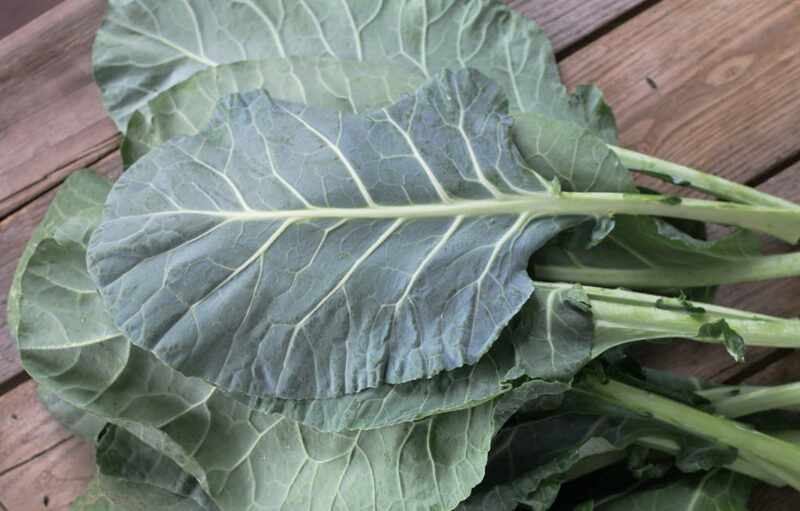 Now we need to clean the greens because there’s nothing worse than sitting down to a big bowl of collards only to find they’re gritty. Ick. Even if they look clean, give them a bath. Fill up a bowl or the sink with water, swish them around, lift them out, then drain out the dirty water. Repeat one more time. 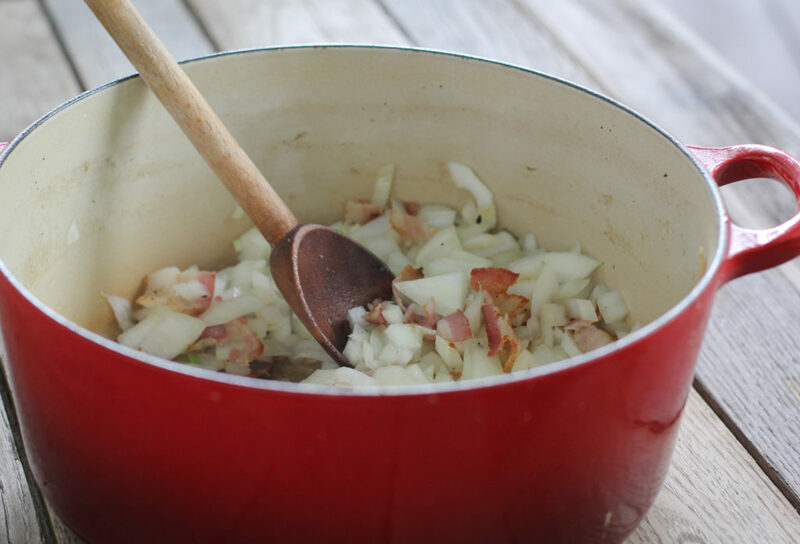 Sauté the bacon and a Vidalia onion, add some garlic, red pepper flakes, and a ham hock or smoked turkey wings. Cover with water, and simmer until they’re soft and velvety. Near the end, mix up a little apple cider vinegar and brown sugar and stir it in. 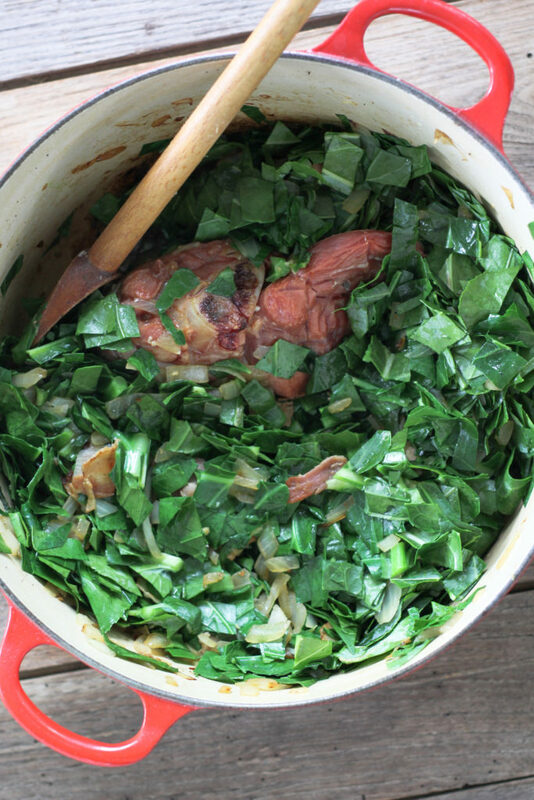 Besides the meat, that little sweet, tangy kick is a critical component of perfect slow-cooked Southern collard greens. I can’t believe I just did this to my young, tender collards. They have died a slow death in this meaty potlikker. I have no regrets. 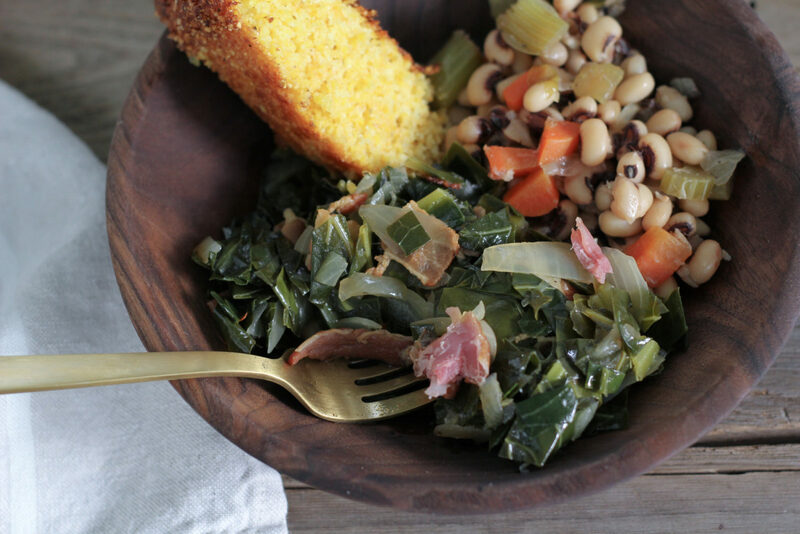 I’m adding the recipe for these black-eyed peas as well as my favorite cornbread at the end of the post to complete the New Year’s trifecta. Heat a Dutch oven over medium. Add the bacon and salute until it releases some fat and the edges begin to brown, about 5 minutes. Add the onion and cook, stirring often, until it's caramelized, about 10 minutes. Add the garlic and red pepper flakes, give it a quick stir, then add the ham hock and the chopped collards. 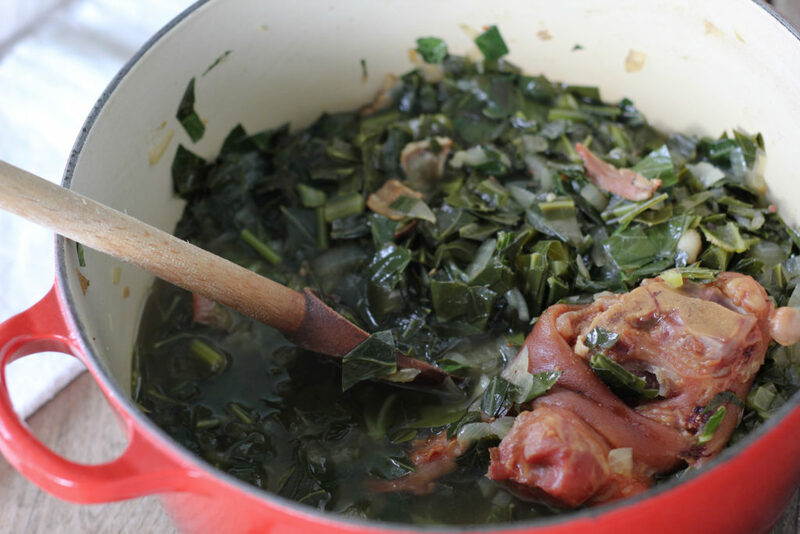 Stir for a few minutes until the collards turn bright green and begin to soften. Pour water over it until the collards, ham hock and/or turkey wings are just submerged. Allow it to come to a simmer. Reduce the heat to medium-low. Partially cover the pot (leave a gap so steam can escape) allow it to slowly simmer for at least 45 minutes (bring it down to low if necessary). 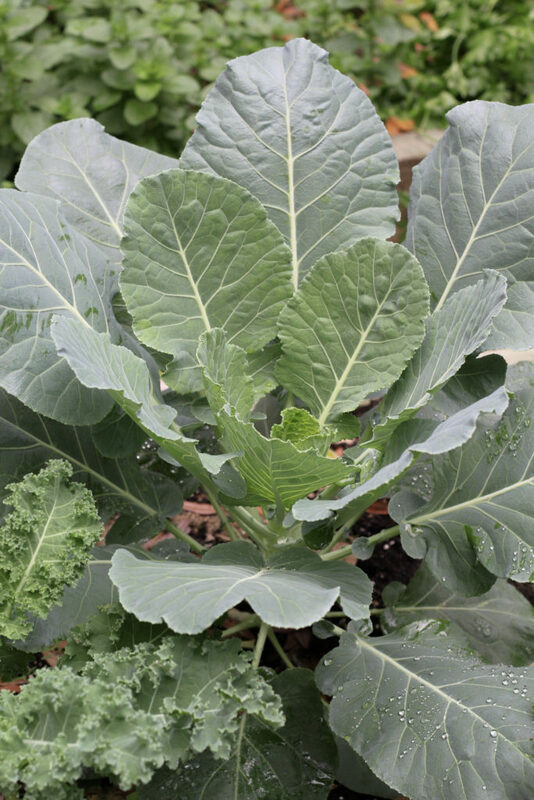 Mix up the apple cider vinegar and brown sugar and stir into the collards. Season with salt and pepper, to taste. If you like, you can pull off some of the meat from the ham hock, chop it up, and add it back in. Keep them going over low heat until they're your desired doneness. 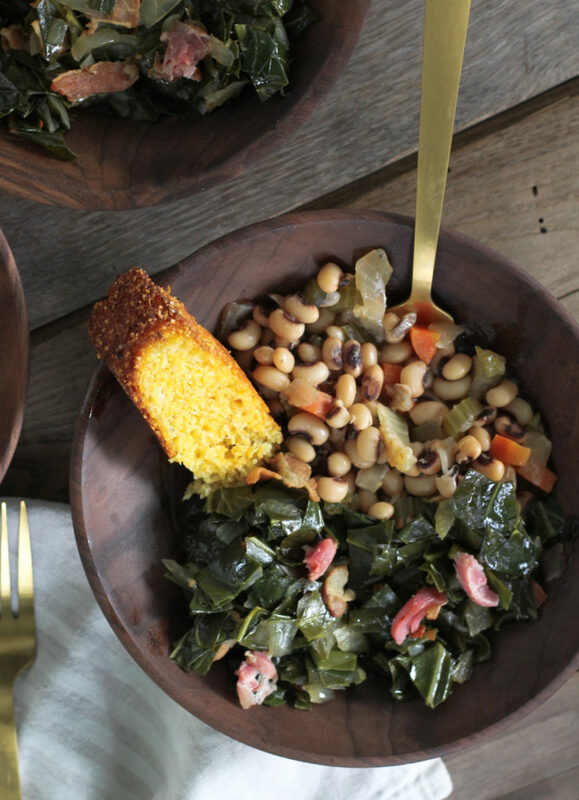 Serve with black-eyed peas, cornbread, and Crystal hot sauce. Sauté the onion over medium for 5 minutes, then add the celery and carrots. Stir and cook until the vegetables soften. Add water and bring it to a boil and add the black-eyed peas and bay leaves. Do not add any salt while the peas are cooking! Cook 10-15 minutes until the peas are tender. Add the ham hock or vegetable bouillon and and Cajun seasoning. Allow it to simmer for about 30 minutes, stirring occasionally. Taste and adjust the seasonings. Keep it on low, the longer the better, until ready to serve. *Marjon brand Quick Cook Black-eyed Peas come in vacuum-sealed packs. I find them in the produce section of the grocery store. If you can't find them, you can substitute 24 ounces of dried black-eyed peas that have been soaked overnight. Put bacon grease or oil in a 10-inch cast-iron skillet and put it in the oven to heat at 400 degrees. Put the cornmeal, baking powder, baking soda, and salt in a large bowl and sift with a fork. In a separate bowl, whisk the eggs, buttermilk, and melted butter or bacon grease. Add the liquid ingredients into the dry. Fold together with a rubber spatula until just combined. Pour the batter into the pre-heated skillet and smooth over the top with the spatula. Bake for 20-25 minutes or until it's golden on top. *substitute the buttermilk with plain kefir or whisk together 1/2 cup yogurt or sour cream and 1 cup milk. I can see why you might be reluctant to cook your first collards to death, but that sure does look good! 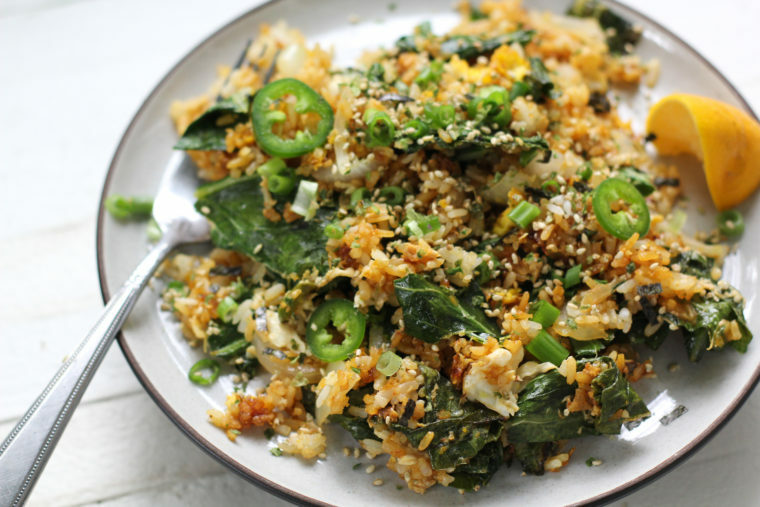 It’s not my favorite way to have collards either, but I wouldn’t turn them down, ever. Especially with that corn bread and black eyed peas you have in the pic. That’s some good eatin’ and there will be some happy recipients, I’m sure! It seemed like a crime, but it really is good. The cornbread recipe is on the blog somewhere, but I suspect you know one by heart. And I may have to add that recipe for black-eyed peas when I have time because they are soooo good. I used the fresh, pre-soaked ones you get from the produce department at Publix near the tofu. I’m definitely making those from now on. Happy New Year, Julie!!! The collards you gave me are big enough for my New Years Day feast! Thanks for another wonderful idea for cooking them. I prefer al dente, but this year it’s BBQ Joint Collards, black eyed peas, and jalapeño corn bread at my house. You coming over? 🙂 You know I’d love to! I’m going to post the recipe I used for the black-eyed peas right quick because they are sooooo good. I’ll update this post with it soon. Have a great big bowl for lots of luck and Happy New Year to you, bt! I can’t wait to try them! Thanks for the leftovers! 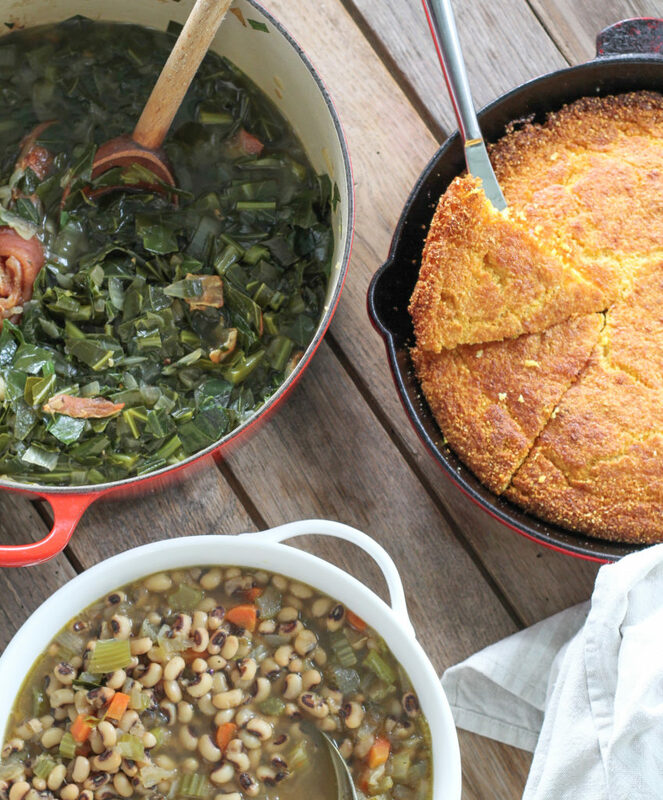 BT – bring that jalapeño corn bread and join us! You won’t have to cook!